Our friend and collaborator Rob Easter (Workhorse Rye) makes some of the best bitters in the bay. Here, he lets us in on a few of his secrets and how the Salted Cacao bitters came to be. I never wanted to make chocolate bitters. I have made drinks with molé and other chocolate bitters for years, and didn’t feel like I needed to contribute much to that world so I ignored chocolate (in a bitters context, not an eating context, please) for quite some time. 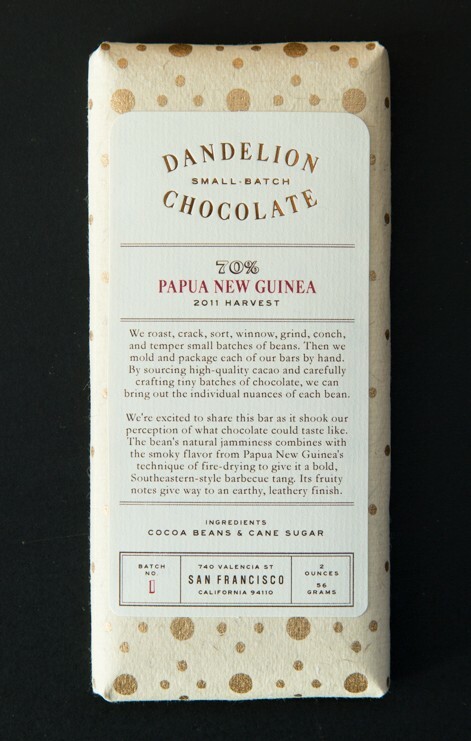 As I started becoming more familiar with Dandelion Chocolate bars, a totally new flavor profile appeared in my mind: cacao bitters. Not chocolate bitters. That sounds silly but it is a totally different beast—a bright, fruity, yet savory beast. I pitched the idea to Cynthia and Greg after their chocolate class at Four Barrel, and asked them for some cacao husk and nibs, separately. I knew the husk would contribute something bitter and tannic, but wasn’t sure exactly what. I put rye on husk and rye on nibs, agitated them for a month and then tasted. It is ridiculous how fantastically good cacao and quality alcohol taste when married for a month. It tastes like wine. Alcohol is a fantastic solvent of course, and it easily extracts the fats and proteins of the cacao. To compliment those savory and bright tones that our rye took from the cacao, we selected as counterparts cardamom, cinnamon, and super cool Piran salt by Bitterman Salt Co. We added some extra bitterness via dandelion root too. After that, it was a simply a matter of dialing it in. After a year and a half, the recipe has evolved, and now we put whole beans (with husk, no separation from nib) through our grain mill the same as we would before making mash for rye whiskey. We use an extra dash of husk too—these are bitters after all, and a pleasant but unique bitterness is what we are after. I like using entire plants as much as possible. Roots, bark, fruit, peel, husk, nib. Not because it sounds wizardlike and “one-with-all” (that’s cool too, I suppose) but because a plant expresses itself in so many ways, and there is core personality in many of those parts. To make a silky chocolate bar, the husk needs to be separated from the nib. It is usually valued as prized compost, aiding in soil aeration, but lately it’s moved to center stage and is more appreciated for what it is: bitter. We rejoice in the name of cacao husk; who would have thought? 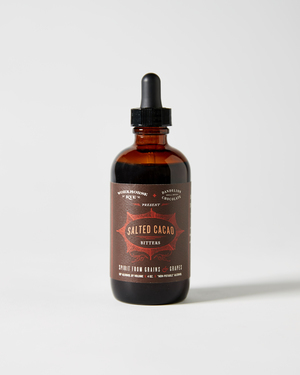 I don’t yet know what cacao root or leaves tastes like, but I foresee that changing for both us and Cacao Bitters lovers. 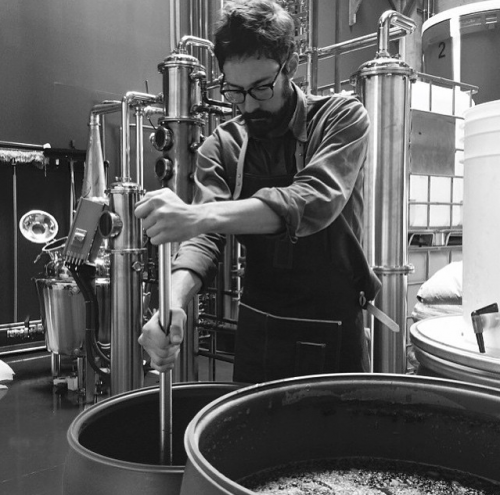 You can find Rob’s bitters on the Workhorse Rye website, or in our Valencia Street factory. To start, try a few sleeves with 2 oz mezcal and 1/4 oz Tempus Fugit Crème de Cacao. Or, stir up a dry Manhattan with rye, dry vermouth, and 3 sleeves Salted Cacao Bitters. When Josh and Evan, the discerning founders of Cool Hunting, sat down with me in the café at Dandelion to talk about a “collaboration,” I was intrigued. Their concept was to create a chocolate bar like no other, and when they brought in the boundary-breaking design firm Snarkitecture to design the bar and packaging, I knew we were onto something. Despite the fact that Dandelion production is so very oversubscribed at the moment, we were up for the project for a few reasons. To begin, it’s a labor of love. Secondly, all of the profits will go to support Southern Exposure, a local non-profit organization. It’s been a year, and we’ve finally arrived at the finish line. 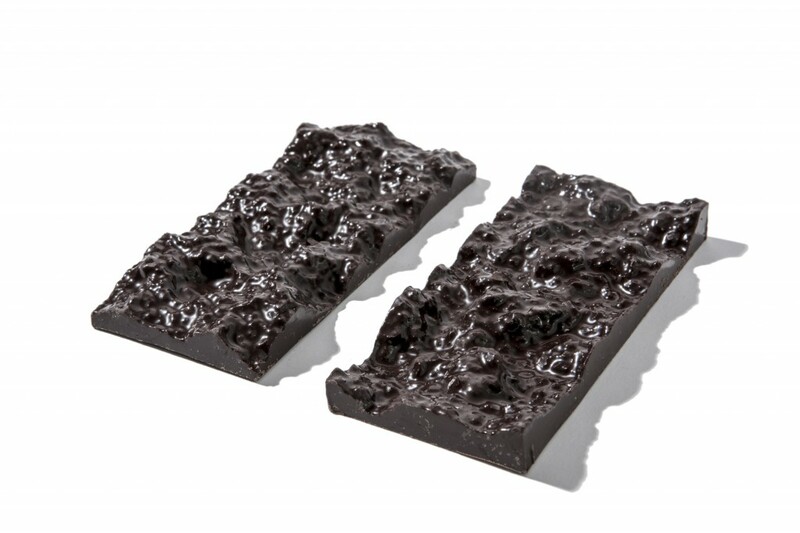 The result is a unique edible artwork in the form of a delicious chocolate topographical landscape. 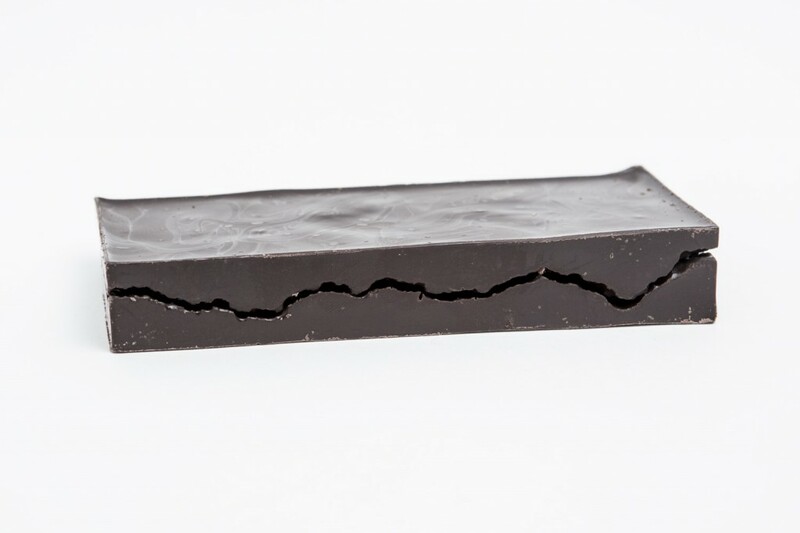 The bar, once unwrapped from its silver foil, reveals a continuous fracture around the perimeter. Along this uneven edge, the bar splits into two pieces, revealing two perfectly opposite textured landscapes. While the Break Bar looks simple, it was quite a challenge to develop. Creating the mold took several remakes. The first turned out to be too hard to temper, and the subsequent tries left a trail of broken bars which, to confess, we enjoyed immensely. Finally, we got it right. 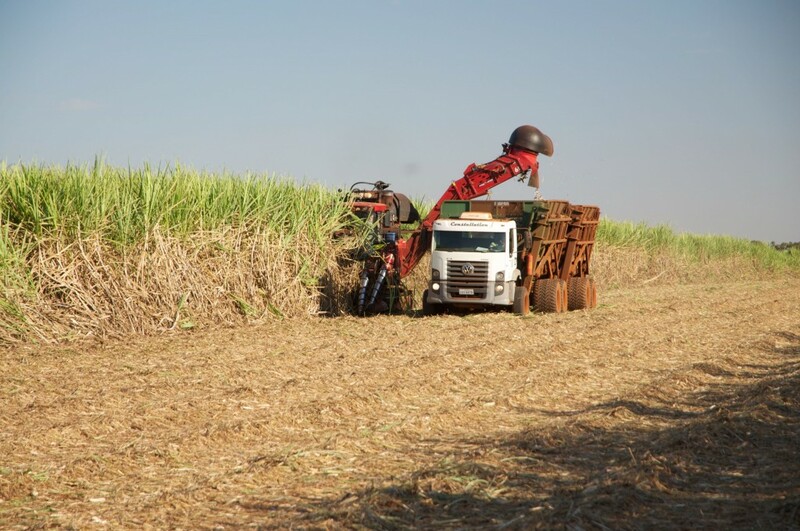 When it came to actually making the bars, the production team was up for the challenge. Little did they know what they were in for. 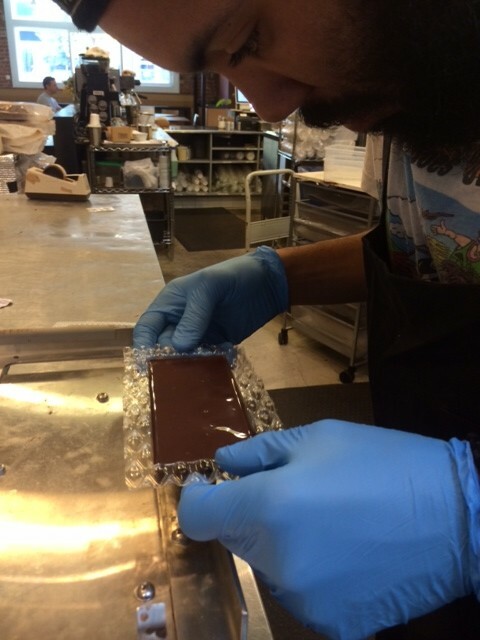 There’s three times more chocolate in a Break Bar than our regular bar, so getting the air bubbles out is no easy task. 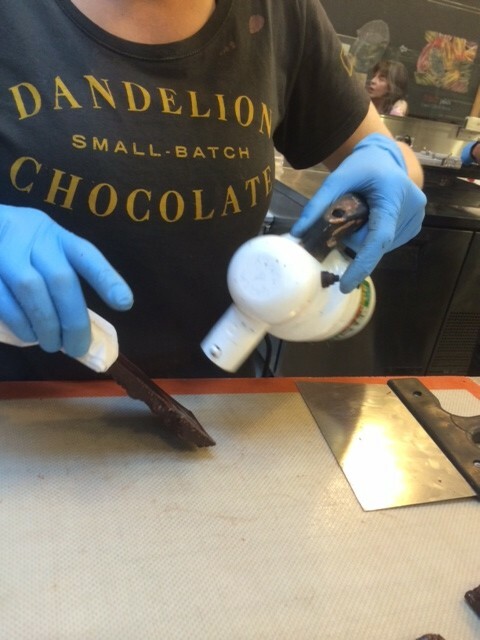 And to get the sharp edges we were looking for, each bar needed the tender attention of a hand-held hairdryer. Even wrapping the bars is difficult. The foil is much thicker than what we regularly use, and the paper is difficult to handle. In the end, for the sake of art, community, and chocolate, it’s all been worth it. To purchase the Break Bar, find it here. PS — We’re producing a limited edition of 500 bars. One out of every hundred will include a “White Ticket,” which rewards the purchaser with a non-edible Snakitecture sculpture in the same form as the Break Bar. 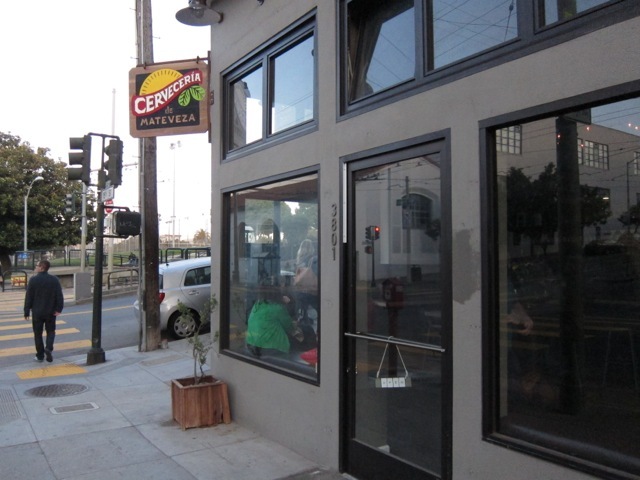 I’ve been hanging out with William Bostwick, a local beer maker that often works at the small brewery La Cervezeria de MateVeza on 18th St and Church a lot lately. We met a few months back when he was buying a bag of Whole Roasted Madagascar Beans and I asked how he was going to use them. “I’m making beer!” he said, as he pulled out a bag of Far West Fungi mushrooms that smelled like maple syrup. He used the mushrooms and cacao to make a great ale for SF Beer Week. William is an inventive and enthusiastic beer maker (and writer) that likes to use unusual ingredients in his beer making, which brought him to Dandelion. That beer turned out really well, so I’ve been working with him and playing with new ideas about using cacao in beer making. We’ve discussed how different origins could be used to get different flavors out of the brews and how to best use the beans. His batches are only around for a couple weeks at the longest and are served on tap at La Cervezeria. All of their beers are brewed in just 20 gallon batches, which lets their brewers have fun playing with new ingredients and recipes very often. 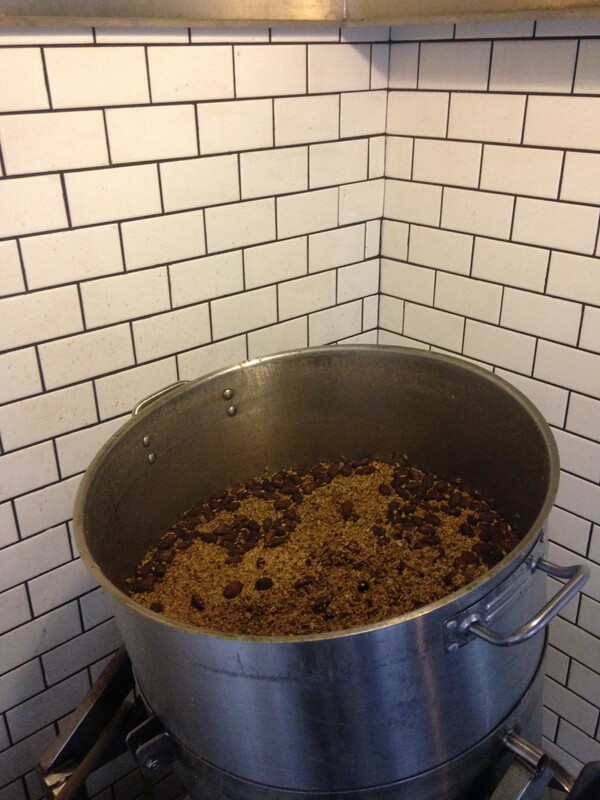 Our most recent batch is a South Pacific Stout made with our Papua New Guinea beans called “Cocoa Crisp”. However, it doesn’t come off as a stout. It is very dark in color with a very creamy coconut body and mouthfeel, but it has a very light flavor profile. 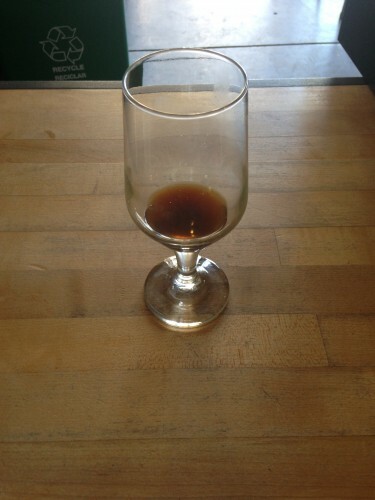 It’s playfully malty and effervescent with undertones of rich prune and… chocolate! It’s really unique and if I were blindfolded while drinking it, I would think of it as an amber ale; it’s surprisingly light in body for it’s color. Alright, let’s nerd out for a minute. I’m new to brewing so all of this was very exciting to me. The base of the beer is Maris Otter Barley, which is a traditional British grain known for it’s “bready” sweetness, that William likened to a honey graham cracker. 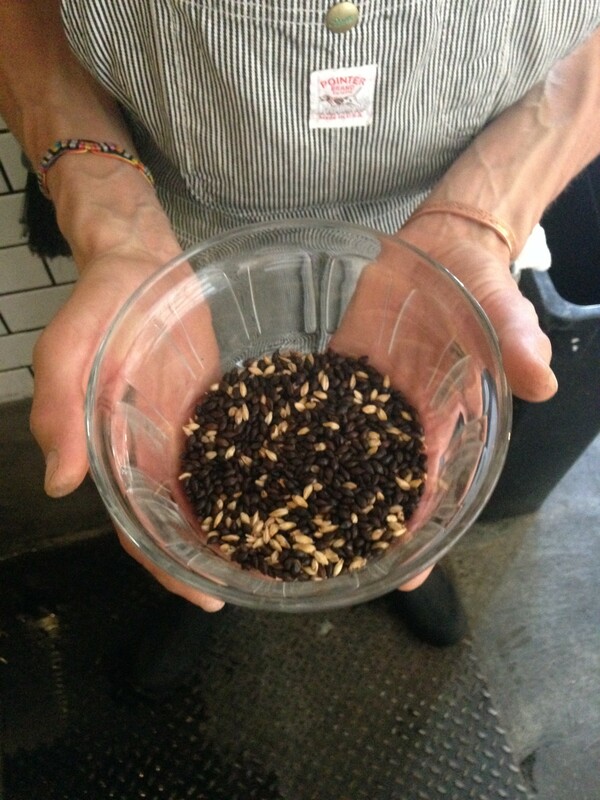 These grains were added to oatmeal (for body) and wood-smoked grains, to emphasize our Papua New Guinea beans’ smokiness, and some dark roasted grains (for color). 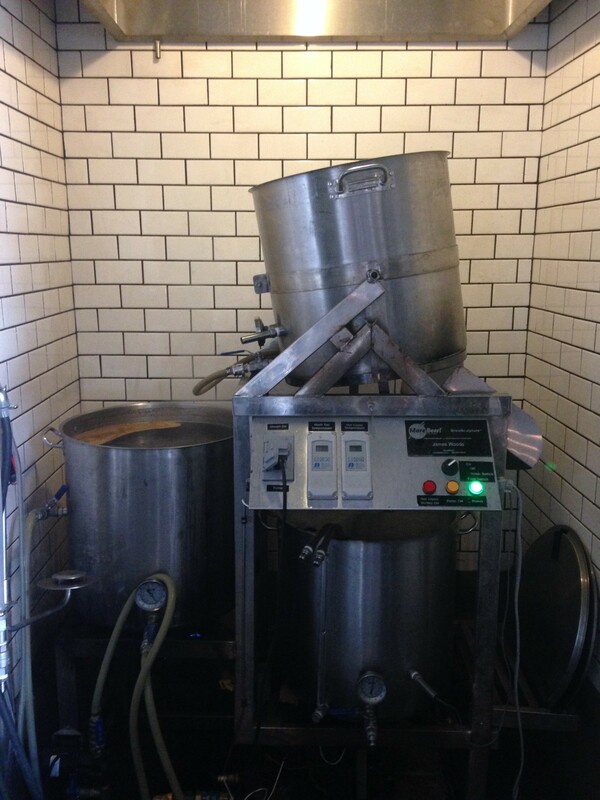 All of these ingredients make up the “mash” for brewing the beer, to which we then added Papua New Guinea Cacao! We were thinking “S’mores” when we thought up this profile, but the beer ended up being much lighter and fruitier than we imagined! We ended up adding the PNG beans to the mash whole and cooking the mash below boiling in order to more more gently extract their flavors. Considering the cacao is naturally about %50 fat (cocoa butter), releasing that much fat into beer isn’t great because it has would decrease the head on the beer, so we decided not to crack them. So we essentially steeped them like a tea in the mash. After we steeped the mash and drained it, we have “wort”. Wort is essentially beer tea. It’s hot, unfermented beer. It’s got tons of sugar in it that’s been extracted from all of the grains and would make a bountiful feast for yeast… so this is the part where we inoculate with yeast! We used a Belgian Trappist Ale Yeast, which ferments with a lot of fruity esters and lending flavor notes of plum, raisin or even caramelized banana. All of these parameters match up with what we’ve gotten out of the cacao in our Papua New Guinea chocolate, so it made sense to use it for the beer. The brew then took about a week to ferment before it was put into kegs (carbonated) and tapped! It’s on tap right now at La Cervezeria if you want to want to go try it! Our Cacao beans from Papua New Guinea are delicious and unique because of the way that they are dried on the farm using wood burning fires that give them a “campfire smokiness”. PNG has a tendency to be very humid and wet, so drying the beans in the sun, as most farmers do, is out of the question. To make up for this, the build huts over metal pipes in which they build wood fires. Then they put place the beans on racks above these pipes to receive heat and dry. Of course, this is all in a very rural area with limited building resources, so some smoke reaches the beans. This is where the “smokiness” comes from, if you’ve ever been anywhere near a campfire, I don’t have to tell you that wood smoke has a tendency to stick to things. There are A LOT more ins and outs to the growing cacao industry in Papua New Guinea, their processes and practices that is beyond my knowledge, but if you want to know more, Greg D’alesandre (our Bean Sourcerer) just got back from a trip to Papua New Guinea and is conducting a talk about his trip, the farms he visited there, and their practices on June 3rd at our Factory on Valencia Street! The presentation will start at 7pm and include photos and lots of fun information. If you’re interested in beer as well as the chocolate side of all of this, there’s going to be an unofficial “after-party” for the talk at La Cervezeria, where you can try the Cocoa Crisp Papua New Guinea beer! Hope to see you there! I love coffee. A lot. (It’s even how I met my fiance, but that’s another story). I also love chocolate and the two make a great pair. 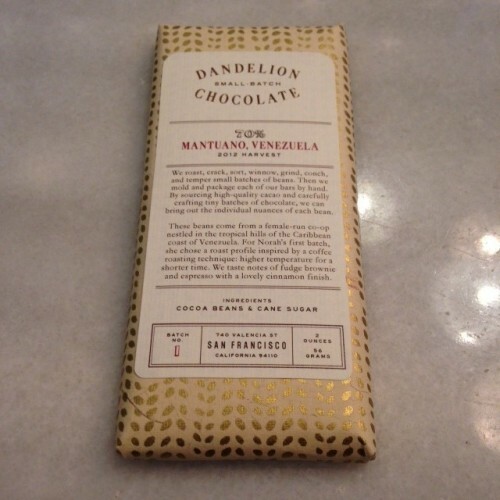 My experience in coffee is how I got started at Dandelion Chocolate. 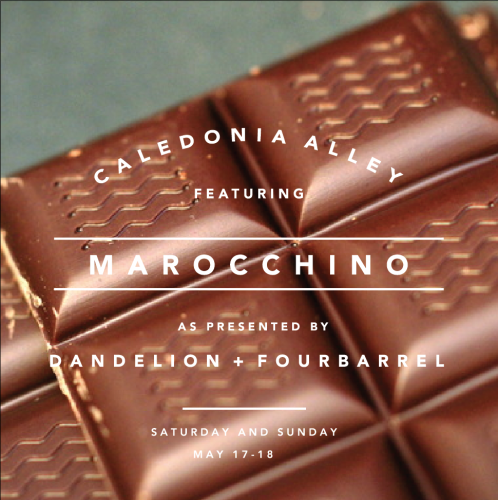 I got involved with Dandelion through our mutual friends at Four Barrel in January of 2013 and I’ve had a great time helping to develop our drink menu. I’ve experimented with different ingredients, origins and methods of preparation for hot chocolates, mochas and coffees alike and it’s tons of fun to be able to adapt our menu seasonally… or whenever we feel like it. We already have a variety of drinkable chocolate options and a few Café Mochas made with Four Barrel Friendo Blendo Espresso, combined in ways that we think blend our single origin chocolate with their seasonally varied ‘spro. Four Barrel has been a great partner to us in the past year as we’ve learned and grown into a full fledged chocolate cafe and we think that their coffee and our chocolate go great together. They roast their coffee only a few blocks down from us on Valencia Street here in San Francisco, and their dedication to ethical coffee and education is super rad and pretty similar to our approach to chocolate; light roasts, small batches, single origin, and personal relationships with farmers. 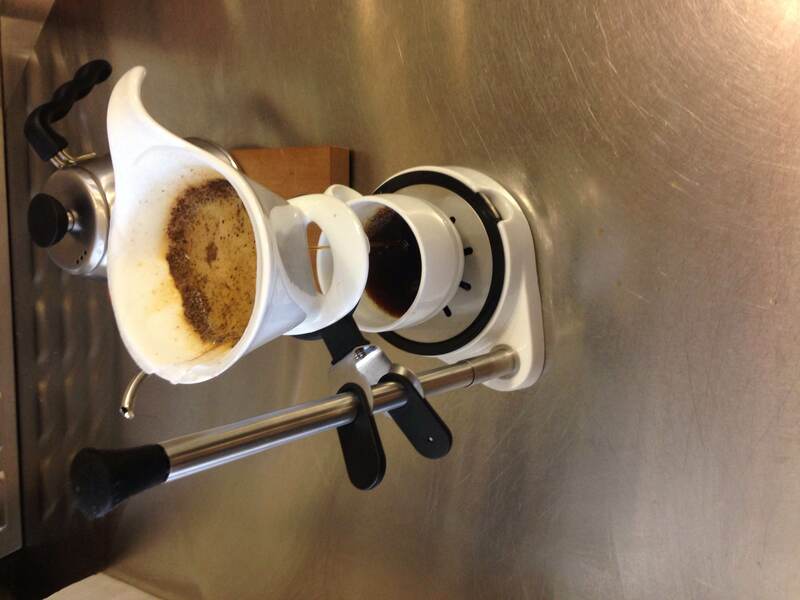 Since opening, we have offered a seasonal rotation of coffees brewed in the french press method. 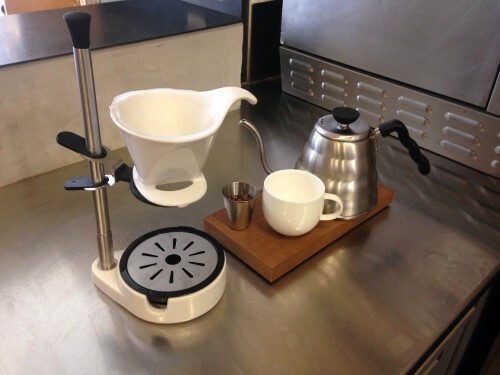 We are now offering single origin coffees brewed in the pour-over method. I think that french press tends to make a cloudy and relatively weak brew in contrast to my personal preference of a strong and clean cup of coffee. French Press produces very pleasant earthiness and silky mouthfeel, but in brewing tends to lose some of the brightness and unique flavors that make our coffee selections really stand out… and that is why we are now offering Four Barrel Coffee brewed via the pour over method. When making a single cup of coffee, the pour-over method makes a really delicious cup of bright, flavorful brew with a crystal finish and I think makes a great pairing with chocolate. 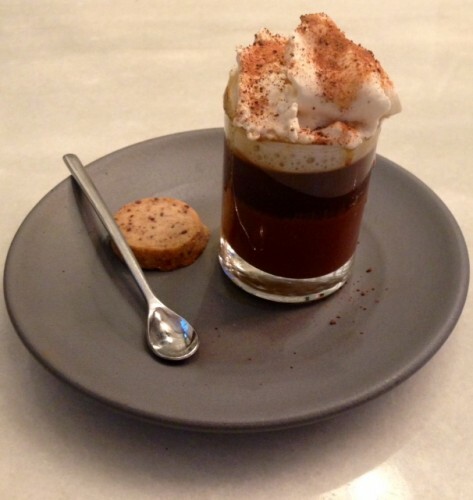 Similar to the way some people pair wines with chocolate or Lisa Vega uses different origins to help certain pastries shine (see: Papua New Guinea S’mores), the unique flavor notes in coffee can pull out flavors in chocolate that one may not have noticed before and vice versa. 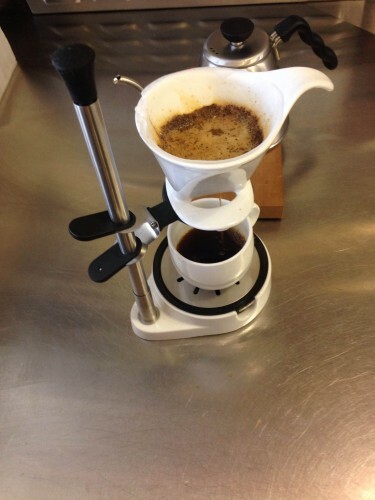 For this reason we are introducing a seasonally rotating pour over coffee option with a pairing suggestion depending both on the coffee that we are currently serving and the chocolates we are currently making. Instead of combining the Espresso and Hot Chocolate, we want to also show how the can complement each other. 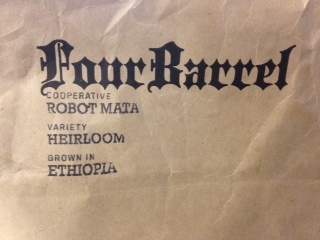 The coffee that we are currently serving is from a co-op farm in Robot Mata, Ethiopia. On its own, this coffee has flavor notes of kiwi, lemon, ginger, green tea, and honey with a very pleasant sweetness that lingers at the back of the palate and followed by a clean finish. 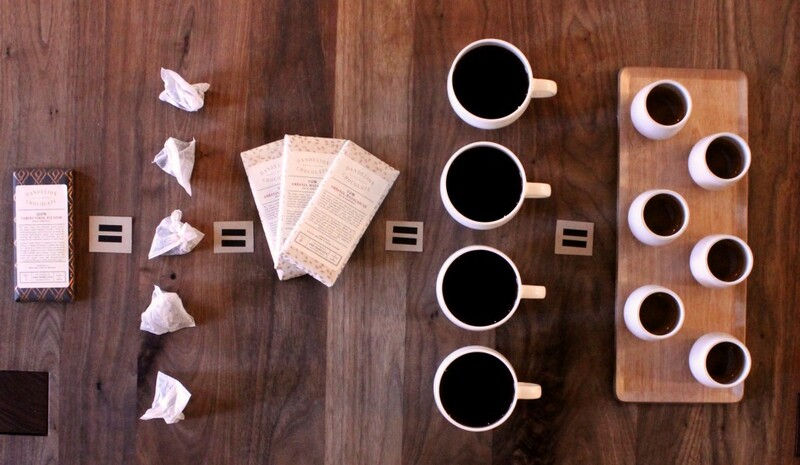 While the flavors of the coffee can stand on its own, when paired with chocolate we get new interesting notes. 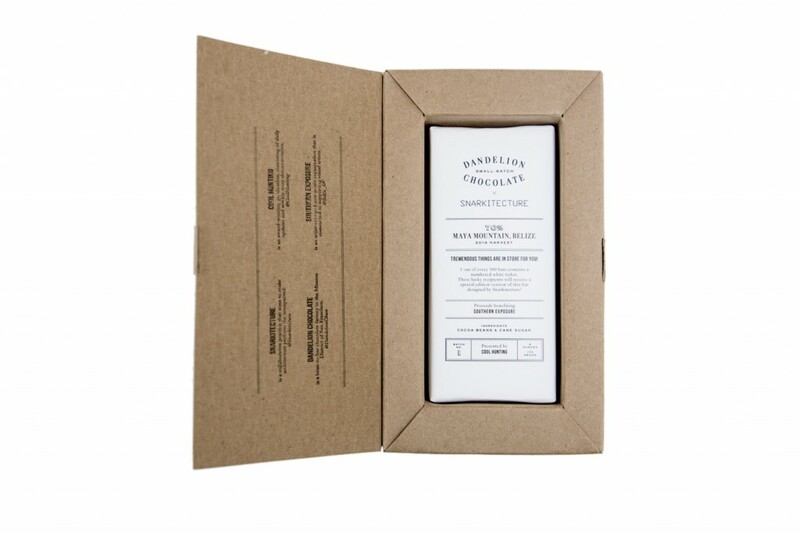 Our newest bar from Ecuador (Camino Verde), has the quintessential flavor of fudge brownies that many people look for in chocolate and is definitely the mellowest of our bars. Having a couple pieces with the Robot Mata is like putting cream in your coffee. The smooth chocolate melts over your tongue and slightly mutes the brightness in the coffee in a pleasantly sweet texture and mouthfeel that makes me forget that I’m drinking black coffee and eating a 70% dark chocolate. 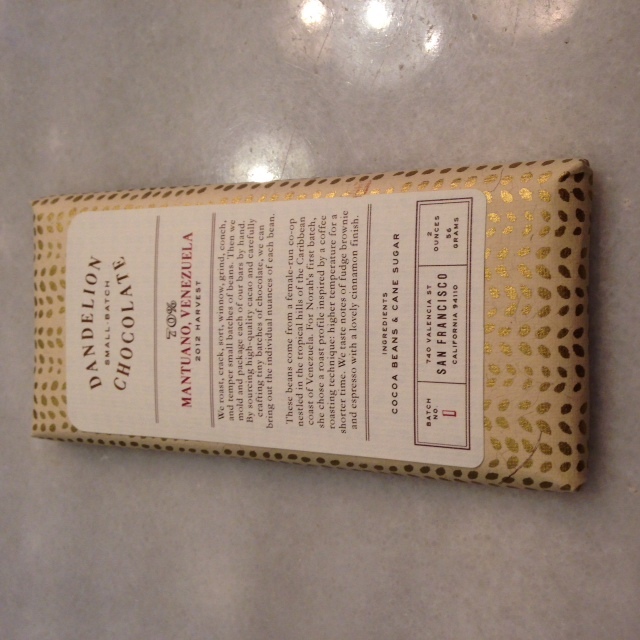 When paired with our chocolate from Mantuano, Venezuela, the slight fruitiness of the chocolate and the coffee play off of each other resulting in a roasty, dried cherry flavor with cinnamon notes at the end and a buttery mouthfeel. This pairing is definitely spicier and more interesting than the Camino Verde, but it really depends on your preferences or mood as to what you want. 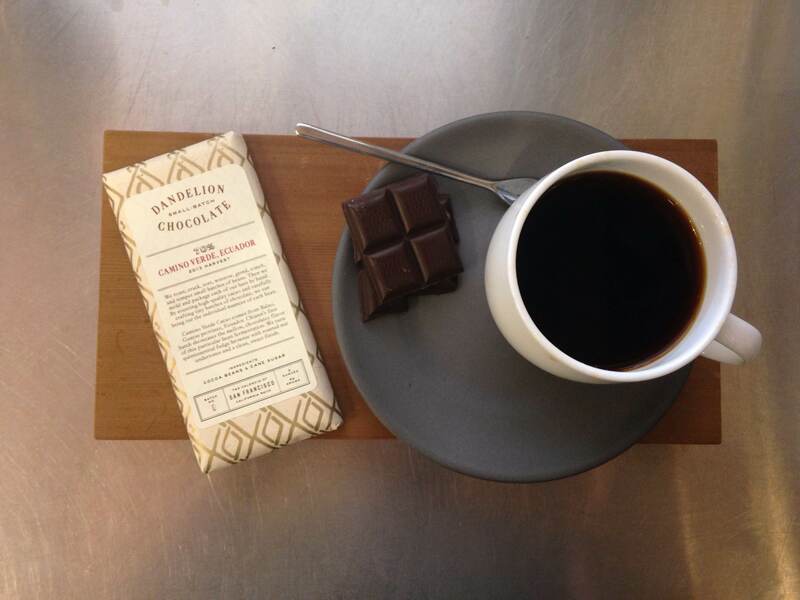 I like a square of the mellower chocolate with my coffee in the morning, but enjoy a more fruity pairing in the afternoon or evening, which is especially nice if you’re sharing it with someone. Everyone’s palate is different, so not everyone will get the same tasting notes out of every chocolate or coffee, so these foster great conversation for the coffee or chocolate connoisseur! If you come in and order a coffee, you can feel free to taste our varieties of chocolate samples on the shelf and think about flavor profiles for yourself and if you find something that you like in particular, you can take home a bar and a bag of the coffee (yes, we sell Four Barrel Coffee Beans!) that we are brewing so you can have the pair that you like at home! Our coffee offerings and pairing suggestions will change seasonally, but each new variety will be chosen thoughtfully with specific pairings in mind. And as always, everyone at Dandelion is more than happy to answer any questions that you might have regarding any of our products or practices. We know that chocolate and Valentine’s Day go very well together, so we created a box of our favorite treats for you to give to your loved ones this holiday. 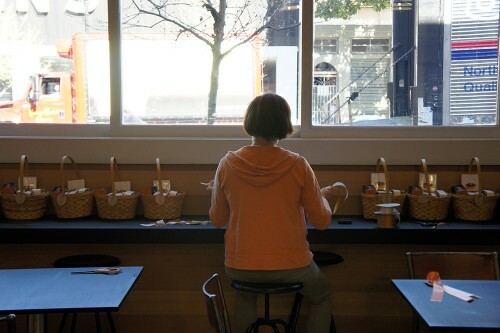 Our boxes include some of our favorite items from our new factory and cafe on Valencia Street. We included each of our own single-origin bars, from Ambanja, Madagascar; Elvesia, Dominican Republic; and Rio Caribe, Venezuela. 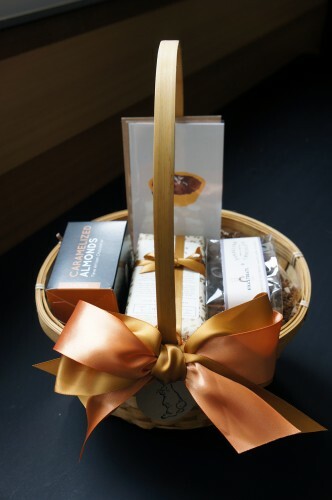 In addition, our box also features treats from two local chocolatiers who use our Rio Caribe chocolate to make delicious confections for our retail space. We have chocolate covered nibs and caramelized almonds from Feve and chocolate covered shortbread cookies from Kika’s Treats. Shawn at Feve and Cristina at Kika’s Treats were two of our favorite neighbors in the Dogpatch. We’re very happy to collaborate with them now that we’ve moved to the Mission. 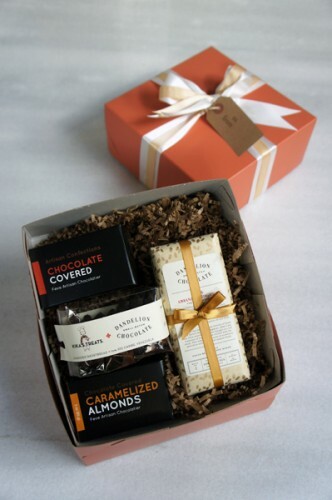 And, they make our box of Valentine’s Day goodies that much more delicious! This box is available for pick-up only. You can preorder a gift box in our online store until Wednesday evening. 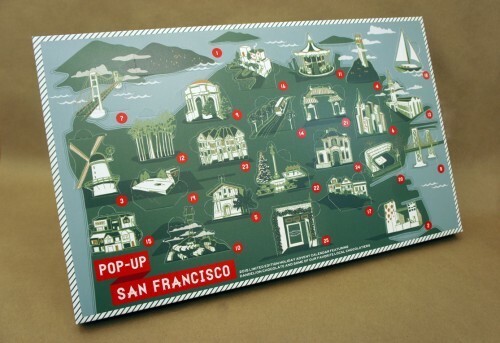 If you do place an order, please come pick up your box at 740 Valencia Street on February 14th, from 11 AM – 6 PM. And! If you’d like to tuck a special note inside your box, Pam from Shotwell Paper Mill will be outside our factory and cafe from 12 PM – 5 PM on Thursday letterpress printing custom valentines on paper made from our cacao sacks! Her notes begin, “I love it when,” and you can finish the sentence with a message to your loved ones. 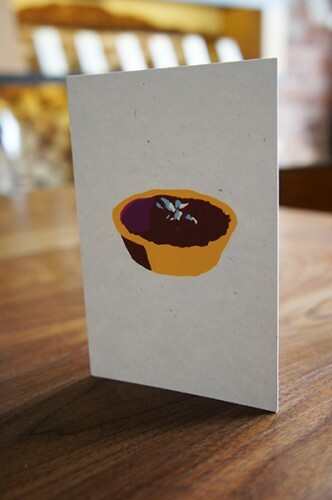 All together, it should be a very special day here at Dandelion.